Audiobook available for purchase on Audible, iBooks, and Amazon. It's five years before Katie runs away to the islands, and this time her travels take her closer to home: back to her law school reunion. With Emily as her plus-one and Michele rounding out the party, their evening at a murder mystery dinner theater goes awry with weird former classmates, too many cocktails, and—oh yeah—a real murder onstage before the cast finishes Act One. Meanwhile, fallen-star Maggie loses out on her chance at redemption in the starring role when she shows up polluted, and Ava gleefully fills in, in more ways than one. Laura, on a stopover between races, attends on gifted tickets from a grateful horse owner, and has a ringside view to the circus. The women's paths crisscross and backtrack over each other in ways that will resonate for years to come, with each holding clues she doesn't know she has to the identity of the murderer, who is far too close to one of them for comfort. >>> See why Pamela's novels have won contest after contest. >>> Once Upon A Romance calls Hutchins an ""up-and-coming powerhouse writer." If you like Sandra Brown or Janet Evanovich, you're going to love Pamela Fagan Hutchins. A former attorney/investigator and a native Texan from Amarillo who spent ten years in the Caribbean and childhood vacations in New Mexico, Pamela splits her time between Nowheresville, TX and the frozen north of Snowheresville, WY. >>> The reviews for the What Doesn't Kill You series are in, and they're good. Very, very good. 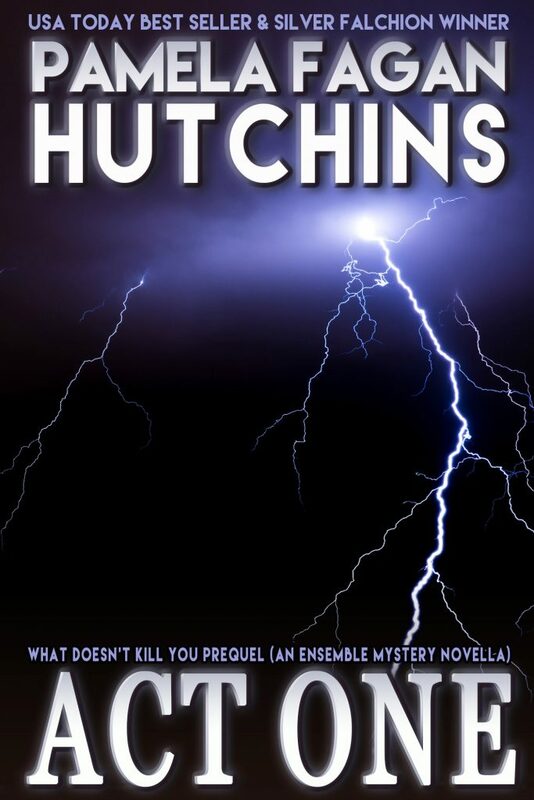 >>> Check out the entire What Doesn't Kill You romantic mystery series, or subscribe to Pamela Fagan Hutchins' newsletter today to get your exclusive, free Act One ebook. Get Book Club Discussion Questions, here. Or download the entire What Doesn't Kill You series guide, here.